Financial Analysis is the cornerstone of all Commercial Real Estate transaction. A properly underwritten property provides knowledge, credibility, and presentation often separating mediocrity from competence. Please choose from the following cash flow modeling options & pricing. To learn more about the specific advantages of each financial analysis option, click “learn more”. Click here to see package Incentives, Payment Options, Terms & Conditions. Deliverables: PDF print-out of reports and assumptions. New to the commercial real estate analysis game, Projection offers a powerful one-two punch of very high level financial modeling with streamline fluidity and incomparable efficiency. If you are looking to create instant credibility with intricate analysis, this is the choice for you. Projection underwrites complicated investments in much shorter time frames than software alternatives. The grumpy old man of Commercial Real Estate analysis, what kind of financial modeling service would we be if we didn’t offer Argus? Tradition tells us professionals often require Argus because of its longstanding excellence and credibility within the field of Commercial Real Estate. Typically Argus financial models are more time consuming (due to complexity and some boredom) but hey, that hasn’t stopped us from knowing it better than anyone else; and sometimes, tradition costs more. With all good things that come in abundance, we offer a discount for purchasing multiple analysis options at once. Simply enter the number of analysis ‘credits’ you would like to purchase during checkout and the appropriate discount will automatically apply. Our goal here at REsheets is to build successful business relationships. One standard in traditional Commercial Real Estate analysis is ‘work together, play together’ or the commission structure. In certain cases, we prefer the commission structure as it provides relief to initial broker up-front cost, and often provides generous dividends to both REsheets and our client. But we need to know about you! It requires a few introductory conversations to ensure a good fit for both sides. If you are interested in this partnership structure, you may contact us here. Just start with hello and you’re interested, the rest will follow. We will underwrite any property available for transaction with the same professionalism and high level analysis we provide for up-front payments. Our typical charge is 10% of a broker’s commission, for any successful sale underwritten by REsheets. It never hurts your wallet to give it a try. The purchase of (1) analysis credit receipt entitles the buyer to (1) complete Financial Analysis, relative to the analysis type, at the buyer’s specified convenience, in the form of a presentation-ready PDF file, or otherwise specified file type. All final analysis reports are guaranteed accurate to the specifications provided by the client. Specifications and Redemption: The buyer may redeem (1) credit receipt at a time of his/her choosing within (2) calendar years of purchase, unless otherwise acknowledged. REsheets will require specific property details to perform the analysis, which will be requested at time of redemption. Please allow 3-5 business days to complete (1) analysis, unless otherwise written. Rush requests are available and can be completed in 1 business day. A record of all purchases and redemptions will be recorded with REsheets and forwarded in the form of a receipt at each point of transaction or project completion. 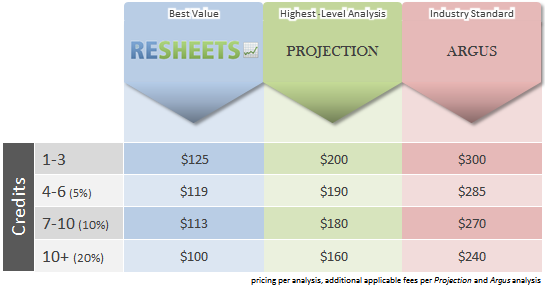 Additional Software Specific Charges: If you’ve purchased either Projection Software or Argus Software analysis, your per tenant/per unit type additional cost will be assessed after analysis completion, and you will be responsible for payment upon delivery in the form of a REsheets PayPal invoice.